Stigmas around drug addiction cause society in general to vilify illicit drug users. However, stigmas cause people to ignore the fact that far wider reaching addictions exist in over the counter medications and prescription medications. Remember at some stage most illicit drugs start off as legal over the counter medications. To highlight this we scoured the internet to build a comprehensive list of addiction disorders commonly treated. 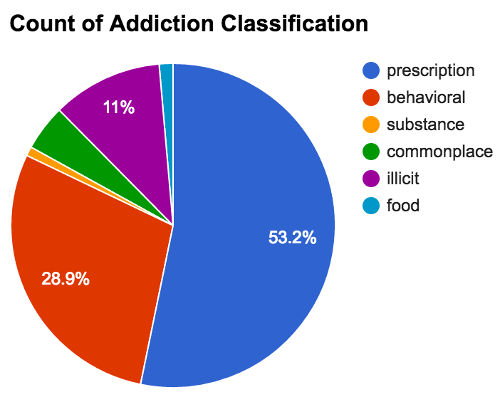 Each was loosely validated to confirm that there were actually communities “in rehabilitation” or “recovery” and while we do concede there are some questionable topics, the general point is that prescription medication addictions are considerably more prevalent.